Do you want to start your own business but you don’t have much cash? Are you a franchise car dealer looking for ways to cut expenses plus add to your bottom line? Then I have something for you! Headlight restoration… I know, I know, sounds crazy right? Read on, I believe you will agree. There is a need for a reputable headlight cleaning business and there is no better time to start your’s than today. Think about this, there are over 256 million vehicles registered in the US. Just about every one has plastic headlights that will suffer some sort of damage in their lifetime. All headlights will get yellow with age. Some will get scraped up in accidents. DIY remedies being used by people often turn out badly. Headlights are expensive. They cost $300-$500 on average. Insurance companies don’t like paying for new ones any more than the average Joe does. Headlights are safety devices required to function properly in all 50 states so there is really no choice in the matter. You can’t deny these problems exist. In other words, this is not just a cosmetic issue. Something else to keep in mind is that body shops have a need to increase profits too. After repairing the collision damage, if one headlight looks new because it was repaired or replaced and the other is yellow… well, you get the picture. Body shops now have a way to make an add on sale. Plus, repairing scraped up headlights is something insurance companies are on board with 100% and they will actually pay you a premium. I know because I used to charge them double. So, how do you restore headlights anyway? There are a lot of DIY remedies out there, you’ve probably even seen some of them. It looks so simple, just rub toothpaste on your headlights and you’re done, right? Here’s one you may have seen on Facebook. There’s a guy who squirts some bug spray on a rag and like magic, his headlights look good again. I have to laugh when I see them because I know from experience what works or not. I have tried some of the more traditional methods you’ve seen advertised. None of them really measure up to LensDoctor®. Few of them last and most of them create additional damage, not to mention, the health risks they pose. 3M, Meguiar’s and just about every other automotive chemical company out there have their own version of repurposed products to clean headlights. Thankfully, when they all came out with their versions, I’d already been doing it awhile. I’m glad too, if these products had been available for me to use, I would have probably tried one of them, found out how difficult they were to use and ultimately given up because of their inconsistent results. In order to be considered for my use, it had to work every time plus be user friendly. My goal was to create a reputable headlight cleaning business. I would have thrown in the towel because everything I’ve mentioned so far is just a quick fix for the do-it-yourselfer. The results vary widely and seldom last more than a month or so. This might be fine for a DIY product but not exactly something you could offer your customers, especially if you plan on doing business with them again. Besides, what could you charge them… 30, 40 maybe $50? Hardly worth losing a good customer over if you ask me. It had to eliminate all the problems with plastic headlights. Scratches, scrapes, rock chips, pitting, yellowing (oxidation) and crazing (chemical damage from polishing compounds). The repair had to be consistent with like new results. An alternative to new replacement. It needed to last a long time, at least 1 – 2 years in order to justify charging a decent price. It had to be a science and not an art. Something I could train others to do. Most importantly, since I would be the one testing and refining the process, it had to be safe to use. Low and behold the answer, as it turned out, wasn’t in the car industry at all but in the optics industry. So I took what I learned, applied it to headlights and LensDoctor® was born. 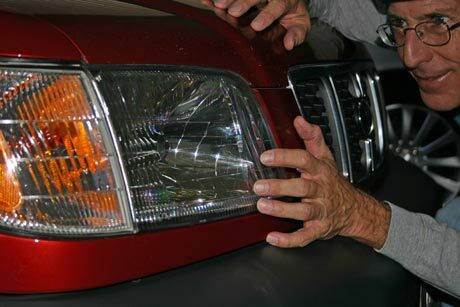 LensDoctor® was probably the first headlight cleaning business that restores headlights exclusively. I created something unique and I got it patented for your protection. I did my product testing on thousands of vehicles in the field, not in some lab on a select few cars. No matter what the damage is to the headlight lens, it just works. I don’t make any wild claims of a lifetime warrantee because that kind of claim is simply ridiculous. What I will promise you is this; you won’t find a higher quality repair or a more cost effective method anywhere out there. What I’m really offering here is a franchise-like headlight cleaning business without all the crazy franchise fees. Sure, you can’t name your company LensDoctor® because that name is taken. You can call yourself a LensDoctor® Certified Dealer though as long as you follow some simple guidelines. I insist we use the same tools so that the quality of your work doesn’t suffer and you must get your supplies from me… that is your franchise fee. The supplies I have for you will cost less than $10 per vehicle (actually between $5-$7 for most repairs). With LensDoctor® you will be able offer the longest lasting, highest quality restoration, your customers will be happy to pay you $150 or more. Don’t let this opportunity pass you by! Call (419) 930-8510 or go to LensDoctor.com to find out how you can get started in this growing niche market! Don’t delay, a year from now you will wish you had started today.